Google Chrome was released in September 2008, along with a 38-page ebook overview with clever illustrations from Scott McCloud (image from page 33 above). As with most Google products, the browser’s market share has steadily increased (currently 6.8% according to StatCounter), so it’s clearly not just a flash in the pan. It’s already surpassed Safari, the built-in Mac/iPhone browser. 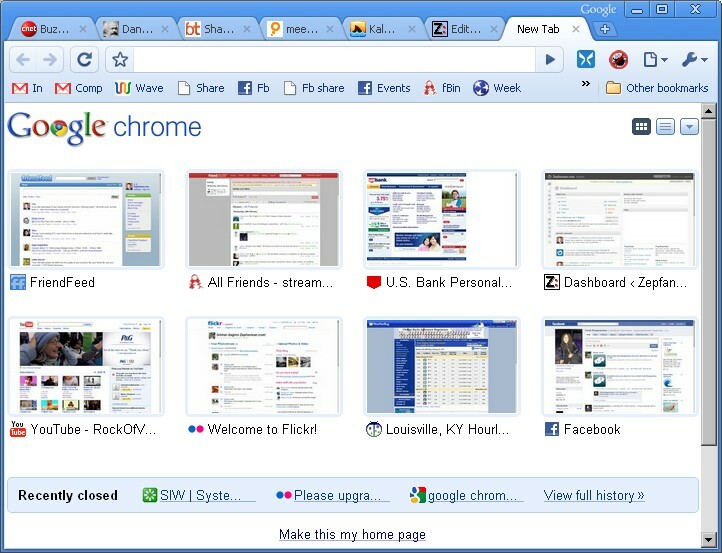 Before reverting to geek-speak, here are a few reasons why you, the common user, should or should not check out Chrome. Wikipedia has a huge browser comparison page, so I won’t go into too many feature specifics. The official Chrome blog has great tips and news every couple of weeks, as well. Only one process/tab crashes, not the whole browser. I’d be surprised if anyone told me they’d never had their browser crash because of Adobe Flash. Flash is a whole other can of worms, but having to restart your browser after having 5 or more tabs open is just a nuisance. This alone is enough of a reason to switch to Chrome as your primary browser. It even has its own task manager (Shift+Esc) to help you diagnose what process is slowing things down. It’s fast and pretty, like a cheetah. Chrome doesn’t let you customize its interface very much; that this hasn’t bothered me is an ode to its minimalistic design. I didn’t even mind it not allowing extensions in its early releases. I’ve always felt comfortable using Chrome because it’s fast, even on slower computers. In contrast, Internet Explorer (IE) and Firefox are more like 600-pound tigers… and, arguably, beached whales. Works on Windows, Mac, and Linux. The latter 2 are in beta, but it’s been nice to have a common interface when I’m on my desktop (Windows XP) and laptop (Ubuntu Linux). You can also configure Google to automatically sync your bookmarks between computers. Drag tabs out of the browser, creating a new window. One of the little things I really like about Chrome. This is now available on Firefox, but it’s not nearly as smooth as Chrome’s design. Incompatible (the 1% negative mentioned earlier). One big advantage IE and Firefox have over Chrome is their bigger user base. I get into this more below, but basically, most web designers make sure their sites work on IE and don’t worry about other browsers. They’d rather paste a “Your browser is incompatible” message on their site than design it to work properly on more platforms. I find myself having to research ways to get certain plugins to work on Chrome, too. It’s usually not that big a deal, but most Internet users don’t have the patience or know-how to remedy these problems. To get into some more philosophical and technical details, there are two main reasons I use Chrome: performance and progressive design. I’ll admit that it is not a browser that “just works” (unlike IE). Instead, it is a browser based on how the web should work. New releases of Chrome support Internet technologies of the future. Microsoft (MS) creates more and more “bloat” (huge program file size) with every release of IE because they don’t want old websites to “break” when viewed in their browser. This is generally true for MS operating systems, although they’ve done a better job of starting fresh with Windows 7 (likewise with Windows Phone 7 Series). I haven’t done any solid research to back up this claim, but I’d say there’s a generally positive trend in the computer industry lately to release products that perform better without having to cater to old technologies. As a systems professional, I understand the hesitation to upgrade because of budgetary and compatibility constraints, but it is because of these constraints that systems professionals exist. I recommend that you download Chrome and give it a whirl. You’ll love its use of Gears if you’re already a Google fan. You will also enjoy the ability to test cutting edge features like HTML5 (e.g. SublimeVideo). I’d be curious to know what features you like or dislike in Chrome. ← Best resources for puppy training?